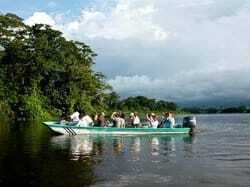 The area of Tortuguero is rightfully called "The Amazon of Costa Rica" because access is only by boat on Jungle Rivers. 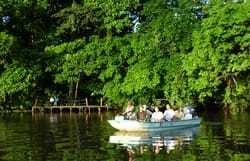 Turtle Beach Lodge, 5 miles north of the town of Tortuguero, is a secluded resort spanning 175 acres with miles of jungle trails, a meandering private canal, and a half mile of beach adjoining still more isolated beaches. The lodge accommodates approximately 40 guests; assisted by a well trained staff and guides who ease you into an exciting jungle experience. Stay in the beautifully landscaped cabinas, swim in our turtle shaped pool, relax in the adjacent shady hammock hut with food and drink from the restaurant and bar. From late June to early October the prime turtle season brings thousands of Atlantic Green Sea Turtles to the beaches of Tortuguero. Leatherback and Hawksbill Sea Turtles, in lesser numbers, arrive to lay eggs from November to May. Come join them for the opportunity to look for these Sea Turtles, and watch their young as they hatch and scamper to the sea. Other common sites are Monkeys, Blue Morpho butterflies, colorful poison Dart frogs, Three-toed Sloths, Parrots, Toucans, and many exotic species of birds. 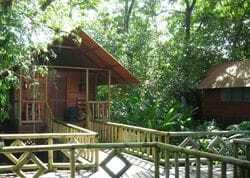 Their rooms feature comfortable beds, fans, cool tiled floors, warm showers, and two wide windows that let in gentle breezes and melodic sounds from the jungle as you fall asleep and awaken. 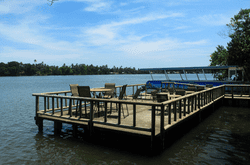 Rooms are available with one double bed, two twins, or one double and one twin. The uniquely designed pool complex at Turtle Beach Lodge features a shady thatched hammock hut overlooking a large turtle-shaped pool, both conveniently situated near the restaurant and bar. The waters of their pool are kept sparkling with an environmentally friendly salt filter, which is equally healthy for skin and hair. Greet the morning with a cup of coffee and a stroll on the beach at sunrise. Relax with ocean breezes in comfortable hammocks on a beach shaded by palms, or write postcards at a table with your toes in the sand. The beach on the property is a half mile long with miles of deserted beach in either direction. It’s like being at the end of the world.